The tangy vinegar in this side dish is a nice compliment to something savory – try pairing it with Yakitori, Burgers, or Hot Dogs! Growing-up I didn’t see my Father’s side of the family as much I would have liked. My Grandmother passed when I was young, but there were several recipes handed down that kept her memory close – this adaptation of her Japanese Cucumber Salad recipe is of one them. Cucumbers are mostly made up of water, which we’ll want to remove by salting. When we salt vegetables, we’re drawing out the moisture through the process of osmosis. We do this for several reasons; we want to remove the excess moisture so it does not dilute the sauce or dressing, causing the veggies to swim in a pool of flavorless liquid. Likewise, it changes the texture of the vegetable – making it more pliable and less crisp. 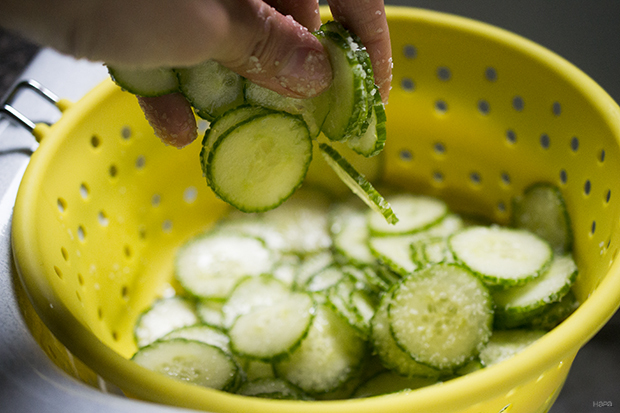 After the cucumbers have been salted for a period of time, you’ll want to rinse off the excess salt. At this point, you may be thinking ‘what the hell, I just spent all this time removing the water!’ When we salt vegetables we’re actually weakening the cell walls and therefore changing the integrity of the cucumber. Simply rinsing well with water will not add moisture back into the vegetable – so it’s ok, rinse away! Taste a slice after rinsing, it should have a slightly briny taste without being overly salty – if it is, rinse some more. The tangy vinegar in this side dish is a nice compliment to something savory – try pairing it with Yakitori, Burgers, or Hot Dogs! The tangy vinegar in this side dish is a nice compliment to something savory – try pairing it with Yakitori, Burgers, or Hot Dogs! Vertically score the sides of the cucumber with a fork. Then very thinly slice and transfer the slices to a colander sitting in the sink. Sprinkle with salt, tossing the cucumber slices to coat (this will draw out the moisture). Allow to sit for 20 minutes. 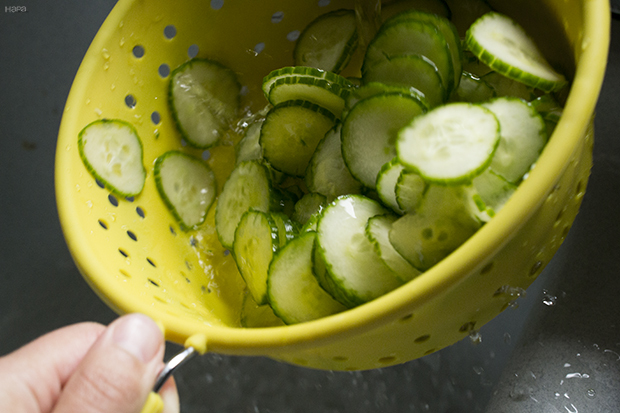 Rinse the cucumbers well under cold water, making sure to remove all of the excess salt. Allow to drain in the colander while you work on the vinegar mixture. In a medium bowl, add the rice vinegar, soy sauce, sugar, and sesame oil. Stir well to combine. Add the cucumber slices to the vinegar mixture and sprinkle with the toasted sesame seeds. Gently toss and keep refrigerated until ready to serve. * If you can't find Japanese cucumbers or Persian cucumbers, you can substitute 1 large English cucumber. It will need to be seeded and cut into half-moons. * The tangy vinegar in this side dish is a nice compliment to something savory – try pairing it with Yakitori, Burgers, or Hot Dogs!